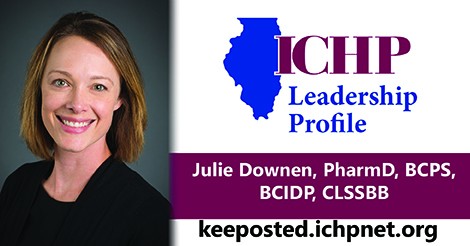 What is your leadership position within ICHP? I am the Central Region Director – Elect. In this role, I will be working with affiliate presidents and champions in the region to address membership and activity needs. I am the Antimicrobial Stewardship Coordinator at Memorial Medical Center in Springfield, IL. I coordinate a multi-disciplinary committee and initiatives to optimize and improve antimicrobials use within the hospital. How have your applied what you have learned from ICHP to your work? One of my favorite sessions was at the Spring 2018 Meeting, “How to Pivot your Way Through Data.” While I had some experience and very limited knowledge, this session really helped me better understand pivot tables. In my work with Antimicrobial Stewardship as well and quality projects, I found this to help me be more efficient and improve my limited skills that I had using pivot tables. Just last week, I was asked to summarize some data and using a pivot table, I was quickly able to put together some graphs and materials needed. Describe a time when you helped fix a problem at work. Recently, I have done a significant amount of work implementing new recommendations for antimicrobial use. This required review of the current practice, meeting with key stakeholders and physicians to discuss alternatives, and then presenting at various committees and groups for approval. This has required follow up after implementation, but overall has been a positive change. Why is ICHP valuable to you? It provides excellent educational, networking and leadership opportunities. Tell us about the first time you joined ICHP. My initial involvement in ICHP began as attending monthly CE presentations for the Sangamiss Chapter. As I went to more meetings and attended the state-wide Spring meetings, I gained more interest in the organization and wanted to be more involved through various positions, such as President of the Sangamiss Chapter and the Marketing Affairs Division. Is there anyone you would like to thank for making you who you are today in your career? When I was in pharmacy school, Ken Peterson helped me get my first job in hospital pharmacy at Memorial Medical Center as a pharmacy technician. As it turns out, when I graduated pharmacy school, I returned to Memorial Medical Center as a pharmacist and have been there for almost 15 years, which has given me many opportunities for learning and growth. What advice do you have for a student? Take advantage of each of your rotations during your final year of pharmacy school. While some of them may not be what you wanted, or may not be an area you like, the more interest you take in the rotation, the more you will learn from them. They may also open doors for future prospects or simply be a great networking opportunity. Describe any special interests or hobbies outside of work. This is a tough one, but for warm weather the Florida Keys. For outdoor adventures, such as hiking and skiing, it’s Colorado (Estes Park and Breckenridge).